The new iMacs are lovely, but the smaller units are hard as hell to get into if you want to make some upgrades of your own. The recent iFixit teardown of the 21.5-inch iMac revealed that you’ll have to unglue your display if you want to swap out your hard drive or add more RAM, even though it’s a piece of cake on the bigger, 27-inch iMacs. Apple added a new feature for the 27-inch iMacs that makes swapping out RAM easier than a push of a button. Well, it’s almost that easy – here’s how to do it. 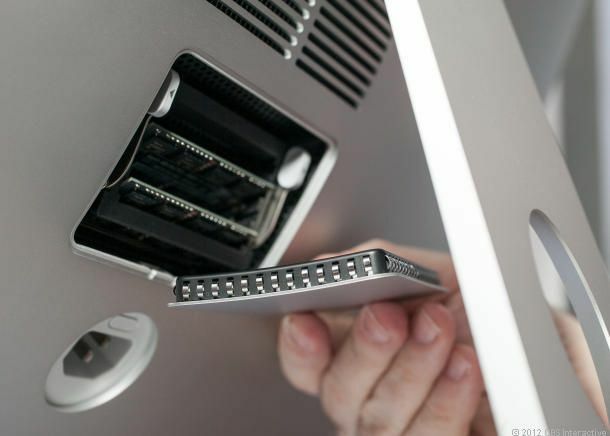 The new 27-inch iMacs come with a memory access port in the back. To open the port, you have to remove the power cable and then push the small button above the plug. Once the button is depressed it will release a latch for the memory access port and you can pull off the plastic cover. Once you have the cover removed you can pop in some new RAM, replace the cover, and you’re good to go. It’s so easy even your mom could do it.